Anna Wintour has been the mastermind behind countless Vogue covers for decades, but it's quite rare to see the editor in chief herself on the cover of a glossy. Today, however, she's traded her behind-the-scenes role for a front-and-center-spot on the cover of Adweek's newest issue. And that's not all: the magazine even dubbed her the Brand Visionary of 2017. In the accompanying story, Wintour revealed what she looks for in employees. "We're trying to reimagine and rethink and understand that different generations, different audiences require different voices, and that's fascinating and challenging," Wintour told Adweek. The key to accomplishing that is "finding people that really have a real point of view," she continued. The glossy also interviewed Phillip Picardi, the digital director of Teen Vogue and Allure, who revealed what Wintour told him in their first meeting: "You have to stand for something." Wintour also clarified exactly why you won't find her on any social media platforms. "I just feel that's not my responsibility in terms of the job I have," she told Adweek. "I work for Vogue and Condé Nast. I don't work for Anna Wintour." How can you argue with that? 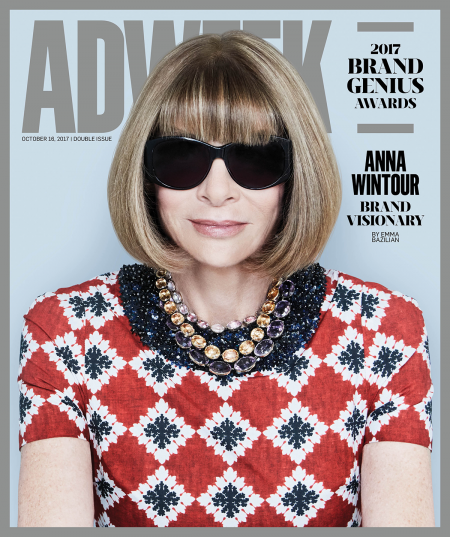 Scroll down to see Anna Wintour's new Adweek cover. Next up, see the three amazing outfits Blake Lively wore before noon today.